We have added open and click tracking stats and notifications for messages sent via Gmail to allow you to see insights on whom you’re engaging with in your inbox and desktop. This is an overview of how to set up open and click tracking and how to get the most out of this new and exciting feature. Can I Track Multiple Recipients? 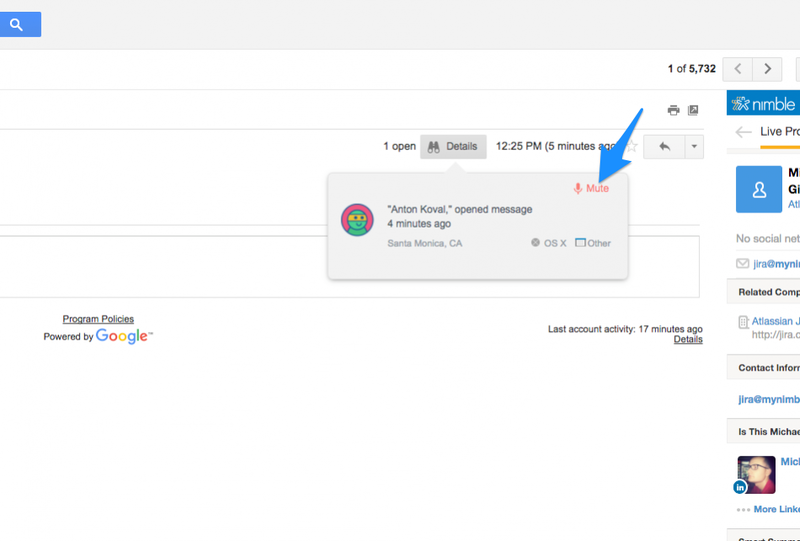 Enable individual message tracking for opens and clicks via messages sent in Gmail. This works for personal Gmail and Google Apps for Work accounts. Once enabled, you will see a desktop notification as someone opens or clicks on a link in your tracked message. See the history of opens and clicks from within a thread. Choose which messages you would like to track and receive a desktop notification for Chrome and Safari. Firefox coming soon. When in the Compose window, make sure the “Allow Nimble Tracking” button is checked to receive desktop notifications. If you would like to not track an email, uncheck the checkbox next to the "Nimble" icon in the Gmail compose window. 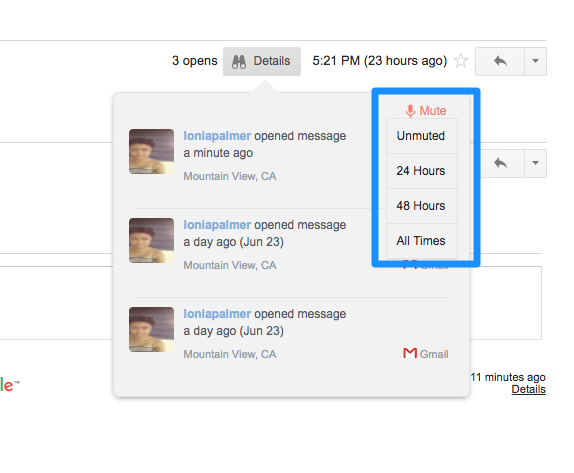 If you would like to mute tracking notifications after a message has been sent, click "Details" then "Mute." You'll then be prompted to choose how long you would like to mute the message. Save time by loading saved email templates from your Nimble account while in the Gmail compose window. Select the template icon to bring up a list of all of your templates created within Nimble. 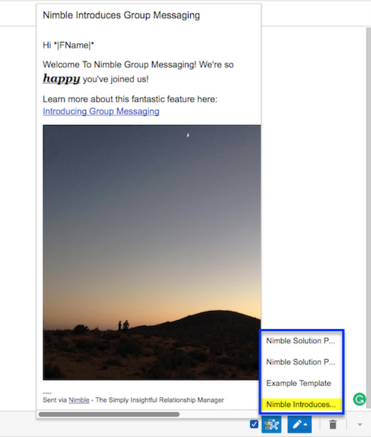 To create new templates, go to your Email Settings in Nimble. Go to Settings >> Notifications in your Nimble account and select the options to enable in-app or desktop notifications. Please note: Desktop notifications are only available for Chrome and Safari (OSX). You will need to double-check in your Google Chrome settings to make sure you will be able to allow desktop notifications. Go to chrome://settings/content/notifications and make sure that the option for "Ask when a site wants to allow notifications" is enabled. When someone opens a message, you will see a pop-up on your desktop immediately after your recipient takes this action. Once you receive notifications on a thread, you can see the history of opens and clicks on your message thread when it is opened in Gmail. 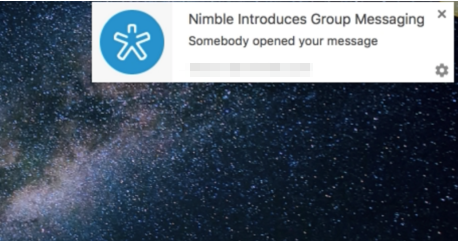 You will also see notifications for messages when you sign into your Nimble Web App, beneath the bell icon and as a pop-up if you have this enabled in your Notifications Settings. Learn more about Browser & Desktop notifications here. Can I track opens for multiple recipients in Gmail? We are only able to track opens for individuals in one to one messages sent via Nimble. For group messages via Gmail, we are only able to say that “Someone” has opened your message. If you would like to see differentiated open and click stats for your recipients, we recommend using our in-app Group Messages functionality. Learn more here.